John Pettie - Portrait of Smith Taylor Whitehead Esq. in a theatrical costume of the 16th Century - Online gallery supplying original fine art. Trending Modern British and Contemporary Welsh. Available for sale from Big Sky Fine Art; this original oil painting by John Pettie dating from 1887.<br> The painting is presented and supplied in a frame dating from between the Wars. <br> <br> John Pettie was an illustrator and painter of historical and literary subjects in oil.<br> Pettie, with other members of the Scott Lander School, is considered one of the major forces in nineteenth century art.<br> <br> John Pettie was born in Edinburgh on 17th March 1839, the son of Alexander Pettie, a tradesman and his wife Alison. In 1852 the family moved to East Linton in Haddingtonshire where he spent most of his childhood. As a child, he drew portraits of family and local celebrities and resolved to become an artist. His family encouraged this and he was sent to reside back in Edinburgh with his uncle, who was a drawing teacher. At the age of 17 he entered the Trustees’ Academy and studied under Scott Lauder, becoming close friends with fellow students McTaggart, Orchardson and Chalmers.<br> <br> Success came swiftly and his first painting was exhibited at the Scottish Academy in 1858. In 1860 he was commissioned to produce illustrations for Good Works, a periodical, and other illustrative work followed. He was a leading member of the Sketching club, formed at the Waverley Temperance Hotel.<br> <br> In 1862 he moved to London, where he shared a studio with Orchardson and from then contributed yearly to the Royal Academy, exhibiting 119 paintings in all.<br> <br> Pettie married Elizabeth Ann Bossom in 1865 and went to live in St. John’s Wood Road and later built “The Lothians” in Fiztjohn’s Avenue, where his kindly genial and hospitable nature drew him a large circle of friends. In 1866 he was elected ARA and became a full member of the Academy in 1873. In 1868 and 1869 wood engravings after his paintings appeared in the “Sunday Magazine”. He also illustrated “The Postman’s Bag” and Wordsworth’s “Poetry for the Young” in 1863.<br> <br> After 1870 he turned to portrait painting, often depicting his sitters in historical costume, as was the fashion of the time, and this was certainly an area in which he excelled and was most popular. <br> <br> In 1891 Pettie began to suffer from an affection of the ear, produced by a tumour on the brain, which caused his death in Hastings on 21st February 1893. He is buried at Paddington Cemetery. In 1894-5 a selection of his works was included in the Winter Exhibition of the Royal Academy.<br> <br> For John Pettie his work was his life. He had a reputation as a kind and generous man, who gave away many of his works to his friends. He had a well developed sense of humour and was well liked. He was renowned for his hard work and for the speed of his painting, his use of drama and rich colour. <br> <br> Today, the paintings of John Pettie are in many major galleries, including the National Portrait Gallery (4), the Victoria and Albert, the National Gallery, the City of Edinburgh Collection and the Glasgow Art Gallery, the Victoria in Melbourne and the Montreal Art Gallery. 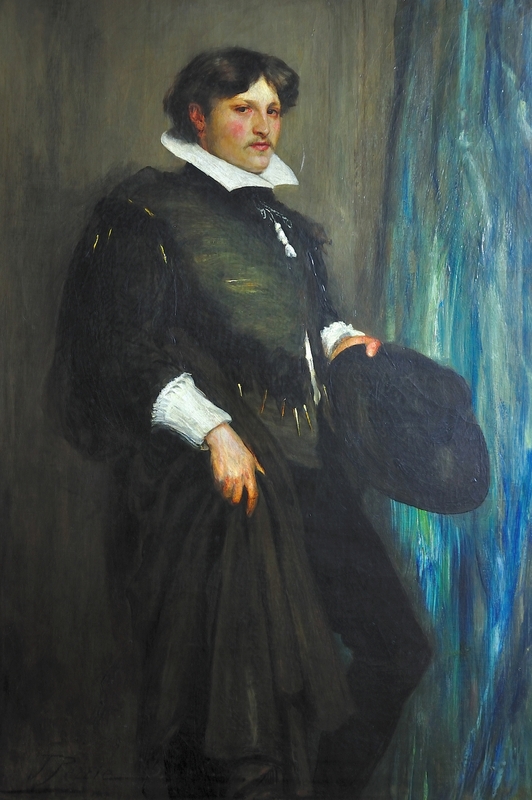 His self-portrait is in the Tate Gallery.<br> <br> The book John Pettie RA by his nephew Martin Hardie gives the story of his life, and a catalogue of his pictures.<br> <br> The picture featured here was painted in 1877 and is a portrait of Smith Taylor-Whitehead in sixteenth century costume. Smith Taylor-Whitehead was High Sheriff of Derbyshire in 1894, and at one time the owner of Burton Chase, a Grade II listed building, now in use as a residential nursing home. This painting was exhibited at the Royal Academy in 1878, the Manchester Jubilee Exhibition in 1887 and the Royal Academy Winter Exhibition in 1894.<br> <br> This original oil on canvas is a three- quarter length portrait. It shows the figure of Smith Taylor Whitehead, a distinguished man of his day, in the costume of a 16th century gentleman. He wears a white shirt with a high collar and ruff cuffs. Over this is a fitted black bodice with a cape or gown to the back. He is holding a Copotain hat in his left hand. He has a ruddy complexion, piercing eyes and the overall look is distinguished, even theatrical. Available for sale from Big Sky Fine Art; this original oil painting by John Pettie dating from 1887. The painting is presented and supplied in a frame dating from between the Wars. John Pettie was an illustrator and painter of historical and literary subjects in oil. Pettie, with other members of the Scott Lander School, is considered one of the major forces in nineteenth century art. John Pettie was born in Edinburgh on 17th March 1839, the son of Alexander Pettie, a tradesman and his wife Alison. In 1852 the family moved to East Linton in Haddingtonshire where he spent most of his childhood. As a child, he drew portraits of family and local celebrities and resolved to become an artist. His family encouraged this and he was sent to reside back in Edinburgh with his uncle, who was a drawing teacher. At the age of 17 he entered the Trustees’ Academy and studied under Scott Lauder, becoming close friends with fellow students McTaggart, Orchardson and Chalmers. Success came swiftly and his first painting was exhibited at the Scottish Academy in 1858. In 1860 he was commissioned to produce illustrations for Good Works, a periodical, and other illustrative work followed. He was a leading member of the Sketching club, formed at the Waverley Temperance Hotel. In 1862 he moved to London, where he shared a studio with Orchardson and from then contributed yearly to the Royal Academy, exhibiting 119 paintings in all. Pettie married Elizabeth Ann Bossom in 1865 and went to live in St. John’s Wood Road and later built “The Lothians” in Fiztjohn’s Avenue, where his kindly genial and hospitable nature drew him a large circle of friends. In 1866 he was elected ARA and became a full member of the Academy in 1873. In 1868 and 1869 wood engravings after his paintings appeared in the “Sunday Magazine”. He also illustrated “The Postman’s Bag” and Wordsworth’s “Poetry for the Young” in 1863. After 1870 he turned to portrait painting, often depicting his sitters in historical costume, as was the fashion of the time, and this was certainly an area in which he excelled and was most popular. In 1891 Pettie began to suffer from an affection of the ear, produced by a tumour on the brain, which caused his death in Hastings on 21st February 1893. He is buried at Paddington Cemetery. In 1894-5 a selection of his works was included in the Winter Exhibition of the Royal Academy. For John Pettie his work was his life. He had a reputation as a kind and generous man, who gave away many of his works to his friends. He had a well developed sense of humour and was well liked. He was renowned for his hard work and for the speed of his painting, his use of drama and rich colour. Today, the paintings of John Pettie are in many major galleries, including the National Portrait Gallery (4), the Victoria and Albert, the National Gallery, the City of Edinburgh Collection and the Glasgow Art Gallery, the Victoria in Melbourne and the Montreal Art Gallery. His self-portrait is in the Tate Gallery. The book John Pettie RA by his nephew Martin Hardie gives the story of his life, and a catalogue of his pictures. The picture featured here was painted in 1877 and is a portrait of Smith Taylor-Whitehead in sixteenth century costume. Smith Taylor-Whitehead was High Sheriff of Derbyshire in 1894, and at one time the owner of Burton Chase, a Grade II listed building, now in use as a residential nursing home. This painting was exhibited at the Royal Academy in 1878, the Manchester Jubilee Exhibition in 1887 and the Royal Academy Winter Exhibition in 1894. This original oil on canvas is a three- quarter length portrait. It shows the figure of Smith Taylor Whitehead, a distinguished man of his day, in the costume of a 16th century gentleman. He wears a white shirt with a high collar and ruff cuffs. Over this is a fitted black bodice with a cape or gown to the back. He is holding a Copotain hat in his left hand. He has a ruddy complexion, piercing eyes and the overall look is distinguished, even theatrical.